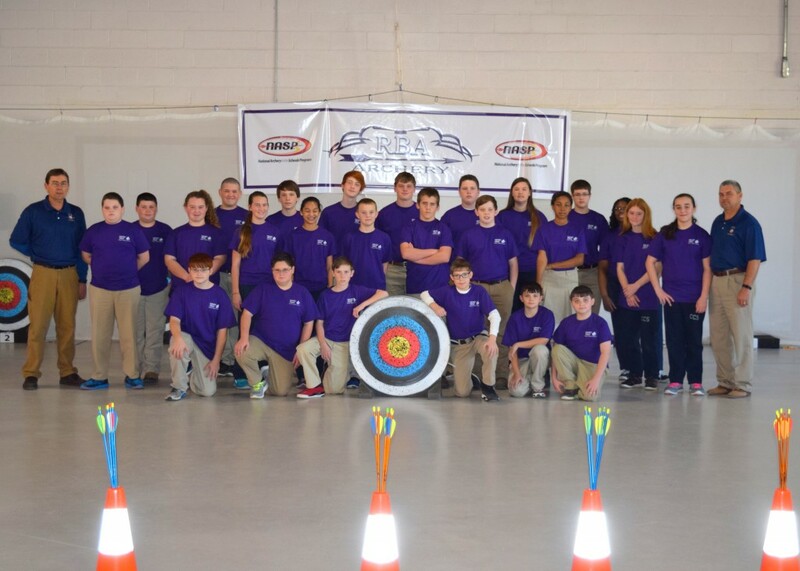 March 3, 2016- Team and individual results released today reveal that Columbus Charter School (CCS) is home to the 3rd place middle school archery team in the state. The second-year team is comprised of 24 boys and girls in grades 6-8. Individually, two CCS archers earned a top-ten ranking of all middle school boys in the state. 8th grade student Chris Lennon achieved a 9th place state rank. 8th grader Lucas Williams achieved the 10th place state rank. Joshua Barnhill earned a 2nd place finish in the 6th grade category. In addition to excellence, this year’s 3rd place ranking reveals tremendous growth. Last year, the first-year team placed 7th in state competition. Coincidentally, CCS’s second-year cheer squad achieved a 3rd place finish in National competition in December. CCS cheer and archery programs were started in August 2014, and join the school’s other athletic programs, football and running club. Students may choose archery as an elective in addition to after school practices. As a public charter school, and unlike a district public school, CCS does not receive any capital funding for things like facilities, maintenance, or athletic programs. Thus, the current catalog of athletic programs offered is the result of staff, parent, and community members volunteering their time and passion for students. Results like these—a 3rd place State Title in Archery and a 3rd place National Title in Cheer—are proof of the high quality programs provided by these volunteers. One such volunteer is CCS Headmaster, Steve Smith, who coached this year’s archery team. He was assisted by Mr. Greg Fisher, husband of Assistant Headmaster of Middle School, Mrs. Carla Fisher. “I love the venue that Archery provides for me to build relationships with students—the time and the access that it allows us to have with each other,” Headmaster Smith states. “I have seen most of these students grow up from Kindergarteners, and I love getting to know them better as middle schoolers. I’m amazed by who they are, and the skills they’ve developed so quickly in the Archery program,” he continued. K-8 CCS also provides both the highest-scoring elementary and middle schools in the Columbus County or Whiteville City school districts on state End-of-Grade tests. The tuition-free public charter school welcomes any student and provides a classical curriculum. Seats are available for the upcoming 2016-2017 year on a first-come, first-served basis. Interested parents can apply online at www.columbuscharterschool.net.